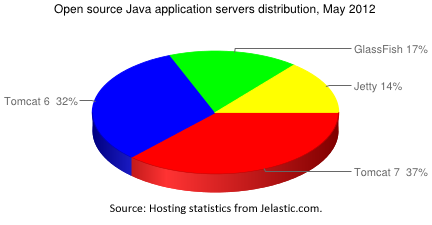 Every month we share stats on the usage and popularity of different software stacks within Jelastic PaaS with you. This month it’s even more interesting, because the scope of our stats has grown: we have a new hosting partner in Russia, Rusonyx. 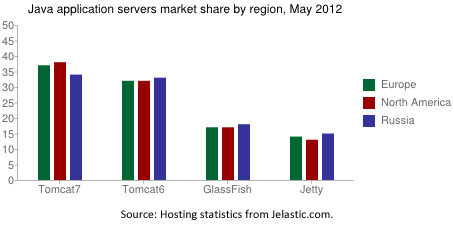 So, let’s check out the stats on databases, servers and JVMs for May and analyze the differences between European, American and Russian developer’s preferences. 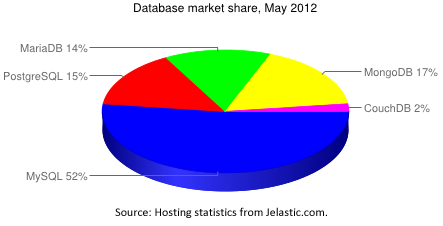 Below is the overall usage of databases within Jelastic for May 2012. MySQL popularity has grown more this month than any other. If we look at the database popularity by region, there are big differences between database popularity on the different continents. For example, MySQL is not so popular in Russia if you compare it with the US and Europe. But the rest databases are more popular among Russian developers. Here’s how the numbers have changed over the last eight months: October 2011 through May 2012. As you can see, Tomcat 7 has not lost any ground. If we look at the same data by region, there really aren’t any huge changes in server popularity and Russian developers seem to agree with Europeans and Americans. Here’s a chart showing overall usage from December 2011 through May 2012. A little reminder: we start in December instead of October because in October and November we had Tomcat 6 as the default server, and now it’s randomized, so the stats now reflect that. As you can see, Java 7 popularity continues to grow: аn 8% increase over April. 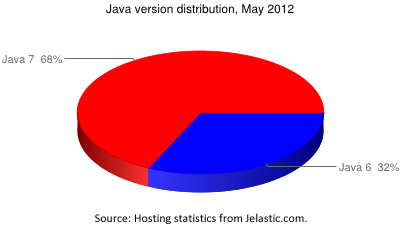 Java 7 is more popular in the US, and Russian and European developers’ preferences haven’t really changed. And finally, here is a Java version popularity chart for the last 8 months. Stay tuned to see the trends next month!